Trying to figure out the perfect schedule for your wedding day? This wedding timeline template will be perfect for you. I’m sure your wedding day seems like a long ways away, but the earlier you can figure out what your day looks like, the better. After reading this article you will no longer be overthinking all the crazy scenarios of what your day could look like. We are going to help keep you from waiting until the last minute and really guide you in tackling the itinerary of your wedding day. After shooting tons of weddings we have a really good grasp on what clients love and what clients hate. This article will provide you with a comprehensive look at every angle possible to figure out what’s truly best for you and your guests. More importantly, keeping your schedule in line with the most optimal times for wedding photography. Let’s dive in and tackle this together. With the nerves and excitement of your wedding day, stress should be as far off your mind as possible. A timeline that outlines all the events of the day helps ease those pre-wedding jitters. But there are a few things to consider before putting anything together. I’ve shot a ton of weddings and have worked with some of the best and worst timelines known to man. Time and time again we’ve come back to a common wedding day timeline template that seems to work really well for all clients and vendors in the wedding planning process – not just the videographer Since every videographer approaches the wedding day very differently, make sure to consult with them and your coordinator to determine what would work best for your wedding day. The following information was gathered from my experience. This by no means is a perfect timeline for ALL weddings. It is simply a suggested timeline to use as a foundation to build upon. CONSIDER HOW IMPORTANT IT IS FOR YOU TO ENJOY YOUR WEDDING DAY? Before you get carried away with all the details and planning your wedding, remember to keep in mind the importance of enjoying your wedding day. It only happens once and it goes by very fast. I like to optimize the time in the most efficient way possible so the bride and groom can enjoy every minute of their day. The last thing we want is for you to feel bored from taking photos + videos all day or being out in the hot sun away from all your friends and family. Consider your day and make sure to enjoy yourself. CONSIDER HOW IMPORTANT IT IS FOR YOUR GUESTS TO ENJOY YOUR WEDDING DAY? Do you want your guests talking about how amazing your wedding was for years to come? Well, don’t forget about them. Remember to keep them in mind as you plan out your day. Having a good flow to your day will allow the guests to have a good time and enjoy the celebration. If they are waiting around for long periods of time before the show can go on, then it can be an overwhelming process. Consider the amount of venue locations, how far people need to walk, how late the party goes, how long the ceremony lasts and how long speeches or traditions take. All of these details add to the overall experience of your wedding day. 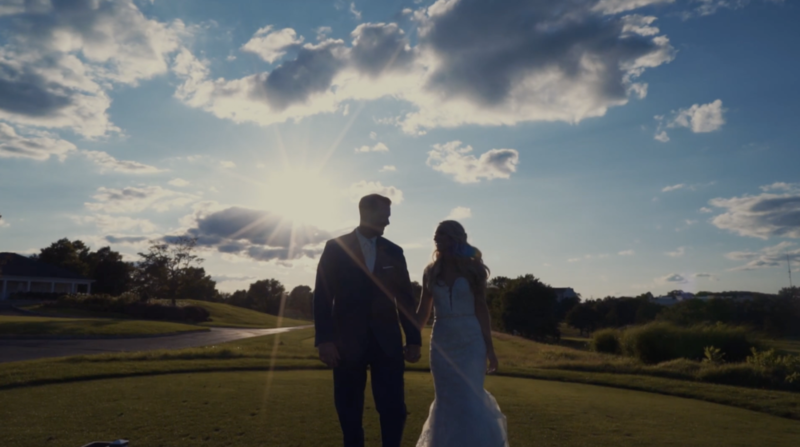 CONSIDER HOW IMPORTANT WEDDING VIDEOGRAPHY IS TO YOU? Having the correct timeline will provide you with more opportunities for better video shots (and photos) and a better wedding day experience overall. Potentially, there are many more details about your wedding day that are unknown to the videographer. It is very important to consult with your planner on the timeline. Most planners will do this automatically for you during the final weeks leading up to your event. This timeline is just a rough outline for what has worked really well in my experience. It might not work for all planners. Usually the planner will consult with all the other vendors you hired to determine if the timeline is appropriate. However, if you’re not working with a planner then the schedules below may be of help to you. Some venues have coordinators or catering managers that have lots of experience managing the wedding day flow. If your wedding includes something like this than we highly recommend bringing them into the loop on the flow of your day. They will be very experienced with knowing the best times to start and end things. Most of the vendors you hire have yet to work with one another. Although, each vendor brings a unique skill to your wedding day, it is possible that each has their own unique needs. This is why the timeline is so helpful. It puts all the vendors in check for when things are happening. That way, if there are any disputes they can be fine tuned with a solid timeline. It will help all parties to do what they do best at the appropriate times without overlap or interference. So please don’t just assume that your wedding day will work itself out. Put a solid schedule together and your wedding day will go smoothly. Questions to ask yourself: What time does the sun set on your wedding day? Why is this important when it comes to video? I primarily shoot with natural light, so we want to get most of our video couples shots done while there is enough daylight. And we want to use some time during the final hour of the day for what videographers + photographers like to call the Golden Hour. This is the time during the day that occurs one hour after sunrise and one hour before sunset. Since most weddings are during the day, I like to use the evening sunset as our Golden Hour opportunity. Here I am able to get a ton of amazing looking photos of the bride and groom in a very little amount of time. I plan for 20 minutes but if we only end up getting 5 minutes it would still be worthwhile. Once you know what time the sun is setting then you’ll have an idea on how to fit everything in your schedule around it. Alright now we’re finally getting to the good stuff. Every photographer loves this question. They love it because they know after doing so many weddings that the flow of the day goes much more smoothly. They come away with more opportunities to get the shots they need and their clients seems to enjoy the day a whole lot more. Doing a first look allows you to get all your necessary pictures out of the way before the ceremony so you can attend your own cocktail hour, eat those fancy appetizers and focus on spending time with your guests. Let’s face it, breaking tradition can be hard and not always possible, especially when one has grown up with an impression of how their wedding day should be. But don’t worry there is still hope even if you decide to not have a first look. A word of advice from my experience: Should you decide to see your bride walking down the aisle for the first time, yet you want to guarantee you get all the shots you need and still enjoy your day. We like to recommend having an earlier ceremony time so you’re not risking losing natural light. If you have a bridal party than definitely do all of those pictures separately before the wedding. That way all you have to focus on after the ceremony is immediate family portraits and the bride and groom portrait session. You may or may not miss your cocktail party but at least you won’t lose out on the good lighting. Should you decide to give in and do the first look, I want you to know that moment when she walks down the aisle will always be an amazing moment regardless if you see her before the ceremony. I’ve seen plenty of guys cry their eyes out during the ceremony even after seeing their bride just before the ceremony. DO YOU HAVE A BRIDAL PARTY? Having bridal parties are awesome! They bring a ton of hype and energy to the wedding day. There’s nothing like hanging out with your best friends before the ceremony. However, the larger your bridal party the more you may want to cushion your time just to be safe. Large bridal parties typically mean more opportunities for potential conflicts in your schedule. Unless you have an insanely cooperative group of friends then plan for the worst by baking in more time. If you’re not doing a first look, consider doing the bridal party groups separately before the ceremony. Rallying both the groomsmen and bridesmaids for one giant photo can be challenging to handle after the wedding. If you’re doing a first look it’s not as difficult. You just want to have only a few shots left on your list for after the ceremony. ARE YOU ABLE TO SNEAK AWAY DURING THE RECEPTION? Sometimes receptions happen when the light is looking awesome, whether it’s at the Golden Hour or during a colorful sky at twilight. I like to plan for 20 minutes, if possible, to steal our bride and groom away from their reception when nobody is noticing. Sometimes it only ends up being 5 minutes but it’s totally worth it. Think of it as another back up plan. If you didn’t have enough time during the day (or if it happened to be raining earlier in the day) for your bride and groom session you’ll always have this as reassurance to keep things moving forward. WHEN SHOULD THE VIDEOGRAPHY SERVICES BEGIN AND END? I begin my videography services during the final touches of hair and makeup. We want the bride to look her best before taking shots of her. If we are shooting before final touches, it is only far away candid shots and/or details. I end my services a bit after the last tradition or once we’ve gotten a good amount of the dancing photos – We find guests appreciate the break from being on camera all day long! HOW MUCH TIME IS NEEDED FOR VIDEOGRAPHY? The rest I can go with the flow or give suggestions if needed once we see a timeline. SHOULD WE DO THE CEREMONY AT SUNSET? If your wedding is outdoors and requires that you have the ceremony at sunset then you’ll definitely want to do a first look and get all your pictures done before the ceremony including all the family formals. But to answer this question honestly, if it’s not necessary than don’t do it. Though sunset time is awesome for lighting it’s not always ideal for a ceremony. Mother nature can have a mind its own and things don’t always run perfectly on time. If things run behind schedule, you may find yourself having a dark ceremony outdoors where lighting can become very challenging. Natural lighting changes very rapidly after the sun sets below the horizon. The skies can look really cool but it’s a risky time to document a ceremony. When you plan for the ceremony right at sunset you’re taking a big risk to make sure everything runs smoothly and you’re not always guaranteed that dreamy golden light. You may have an overcast day for all you know and the lighting toward the evening will look no different than it does during the day. Always try to plan with a balance between what is safe and what is ideal. WHEN SHOULD THE PHOTOGRAPHER RECEIVE THEIR MEALS? For me, the best timing for the meals to be served is just as the guests are being served (usually no photos are taken at this time). Most caterers wait until after the guests receive their meals because it’s “proper” but sometimes it risks the chance of missing important moments. The goal is to be done eating before the guests finish eating. That way nothing important is accidentally missed. HOW TO KEEP THE RECEPTION FROM BEING A DRAG? Usually receptions become a drag because of the mixed crowds, lengthiness or the lack of activities. Not every group wants to dance until the morning. So mixing it up throughout the night is very important. Sure dancing may be going on the entire time but make sure to provide other things to make the reception interesting to everyone or you may have some sneaking out on you. This doesn’t mean spreading out all your traditions late into the night. It just means doing things quickly and simply. If you have formal dances, do them all at once. If you have some toasts keep them short and sweet. If you do a cake cut don’t make a huge production out of it. I think weddings that have lots of little things happening in various places at various times allows people to move about freely without feeling forced to follow a strict program. WHEN SHOULD I HAVE MY TIMELINE FINALIZED?